LINCOLNSHIRE, IL--(Marketwired - Sep 27, 2016) - Eddie and Margie Richardson of Nashville, Georgia are the second lucky instant winners of a new 2016 Coleman® 262BH travel trailer valued at $18,000 in the Camping World and Good Sam Golden Giveaway. The Richardson's received their lucky Golden Giveaway scratch-off ticket at the greater Valdosta area, Camping World SuperCenter, and to finalize their prize they will pick up their new trailer from the dealership located at 5244 Jewell Futch Rd, Lake Park, GA, this Saturday, October 1 at 10am. The promotion was part of the 50th anniversary celebration for Camping World and Good Sam, in which up to five new Coleman travel trailers could be given away plus a grand prize of a 2016 Thor Windsport Class A motorhome valued at $140,000. Five million dollars in free camping was also promoted as part of the celebration. "We congratulate the Richardson family on being our second travel trailer prize winners, and most importantly, we thank them for being a loyal Camping World and Good Sam customers," said Marcus Lemonis, Chairman and CEO of Camping World and Good Sam and host of CNBC's The Profit. "Camping World and Good Sam are known for being at the forefront of today's RV industry, while still adhering to the values that have helped us reach 50 years like providing professional customer service, expertise and products that you can count on." The Golden Giveaway was one of several events scheduled throughout the year to celebrate the 50-year milestone of the world's two biggest names in the RV lifestyle industry. Other events included monthly special promotions at Camping World SuperCenters, special sales and low prices on select products, service and installation specials, and a huge birthday celebration in July at Camping World SuperCenters nationwide. For more information and complete rules for the Golden Giveaway, visit The Golden Giveaway promo page here. In 2016, Camping World marks 50 years of offering specialized products, expert advice and great service to recreational vehicle owners and campers across North America. From our founding in 1966, we've grown from a single store in Bowling Green, Kentucky to the nation's number one retailer of RVs, RV accessories and RV-related services, with 120 SuperCenters nationwide, a state-of-the-art call center and an award-winning website. Over the last half century, Camping World has become the premier one-stop-shop for everything RVers need to enjoy living and traveling in their RVs, as well as a vital source of products and services to help RV owners maintain and protect their investment. Along with over 10,000 RV parts and accessories, we also offer a full selection of new and used RVs for sale; RV and tow vehicle service and maintenance; collision centers; RV Spa detail and refurbishment centers; technical advice from knowledgeable experts, and hard-to-find parts. Good Sam, a subsidiary of Camping World Holding, Inc. is the world's largest RV owners' organization offering helpful technical tips, vacation planning, extended warranty, magazine subscriptions, roadside assistance and more to serve the outdoor enthusiast. Marcus Lemonis is an entrepreneur, investor, television personality, and chairman and CEO of Marcus Lemonis LLC as well as Camping World and Good Sam Enterprises. Camping World is the nation's largest RV and outdoor retailer, and Good Sam is the world's largest RV owner's organization. Visit http://www.campingworld.com. Lemonis is known as the "business turnaround king" and host of CNBC's prime time reality series, The Profit, in which he lends his expertise to struggling small businesses around the country and judges' businesses based on a "Three P" principle: People, Process, and Product. The Profit airs Tuesdays at 10pm ET/PT on CNBC. 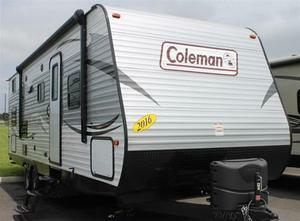 2016 Coleman 262BH Travel Trailer. For illustration purposes.